Not only should the Languedoc region be known for its recent ascension concerning the production of delicious red wines, but also for bringing up some exciting whites. 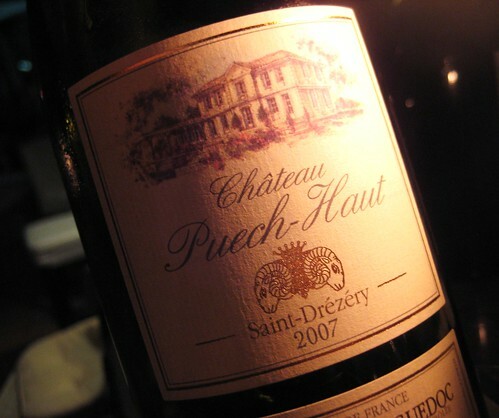 Proof is brought by Château Puech-Haut’s Tête de Bélier Blanc. Several times already I enjoyed the solid red cuvées of this domaine and now I finally had the occasion to taste the white wine on which and I have heard quite some praises over the years. My first impression was that this is quite a bullet. Its color is intense with golden hue. The nose is equally intense with at first not discernable fruit notes and some oak coming through. The weight on the palate is impressive, the wine’s attack is vibrant yet balanced, the structure massive without being alcoholic although the label figures some impressive 15%, the aromatic feel is intense of tart fruit without being bitter and the length is more than satisfying. It is also a wine that needs air and a little time to open up: after half an hour the distinct fruit notes are slowly becoming more perceivable with the wine taking on a citrus-like direction. Unfortunately the bottle had already vanished before we could further examine its evolvement, but I bet it would have gained in complexity. Hard for me to tell with what kind of wine this one is comparable, my experience with white Burgundies, Bordeaux’ and other Hermitage being very limited, but it’s definitely worth a try.